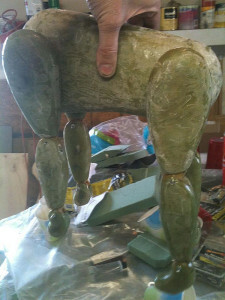 This Marionette Dog was first carved from green foam. 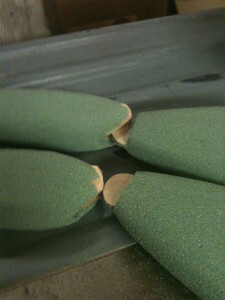 The joints on the legs are reinforced with craft plywood. Then everything is coated in epoxy. After it is sanded down, all the pieces are sturdy and strong.Everything is then covered in felt and was put on with spray glue. The nose is left as the epoxy, but was painted with enamel paint mixed with a black iron oxide. This gives it the realistic look. 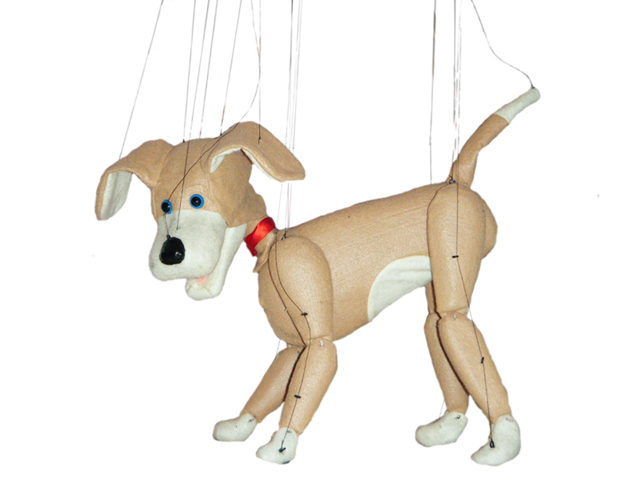 The ears are weighted down and controllable with strings. The legs are controllable, with the back legs cross-strung so that they work in opposite of the front. The mouth will open and close, and you can even have him pick up a ball with it. There is also a magnet embedded within it’s mouth, so that you can put another magnet in a rag so that you can play tug-o-war.